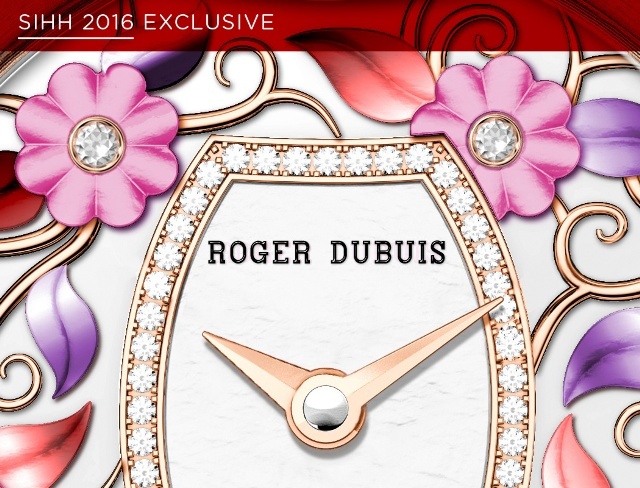 With its SIHH releases, Roger Dubuis begins a yearlong focus on its Velvet collection of richly decorated watches for feminine wrists. For men, the all-Geneva Seal watch manufacturer will offer an interesting lightweight carbon-cased Excalibur Automatic Skeleton Carbon. Ladies first. Two new Velvet models demonstrate that Roger Dubuis CEO Jean-Marc Pontroué is very serious about expanding its draw beyond its largely male clientele. With about twenty percent of its total sales, the firm’s Velvet ladies models will push that figure higher in the upcoming year, says Pontroué, especially with all of 2016 dedicated to the Velvet collection. The 36mm Velvet Secret Heart, offers a double retrograde date function, a nice match for the watch’s tonneau gold case shape since it follows the symmetry of the blue dial. The double retrograde is the first so-called small complication seen on a Velvet watch, and here it’s meant to enchant the wearer as each red date hand in turn completes a trip down its side of the dial to then jump back to the start of its day-to-day journey and disappear entirely as the other hand takes over. The jumping and timekeeping are driven by an entirely new automatic RD821B caliber. A closer look at this interesting ladies watch will betray another secret: its curved Roman numerals appear to resemble a vase that’s overflowing with magical time. 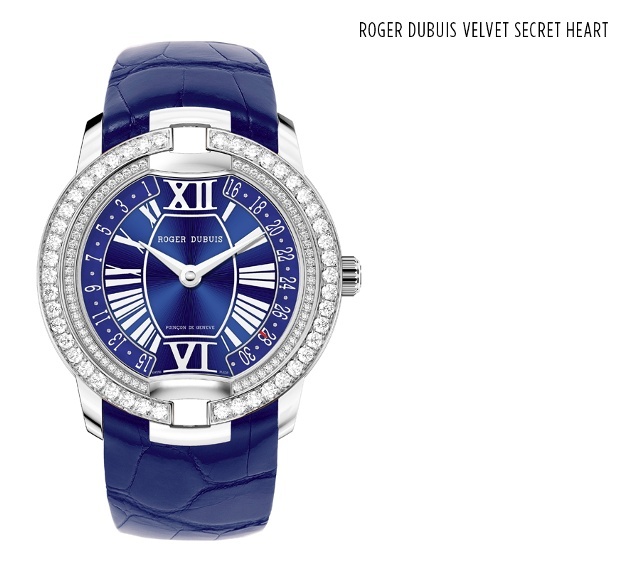 There were two main reasons behind our decision to use this kind of approach on the Velvet Secret Heart, explains Roger Dubuis’ Product Strategy Director Gregory Bruttin. Firstly, the smaller (36mm) diameter of a ladies’ watch made it even more important to ensure the readability of this indication that is eminently useful in daily life and not merely decorative. And secondly, the choice of a bi-retrograde interpretation provided even more space and enabled us to accentuate the intensely magnetic femininity of the dial by opening up an almost 360° panorama and hiding the hands. 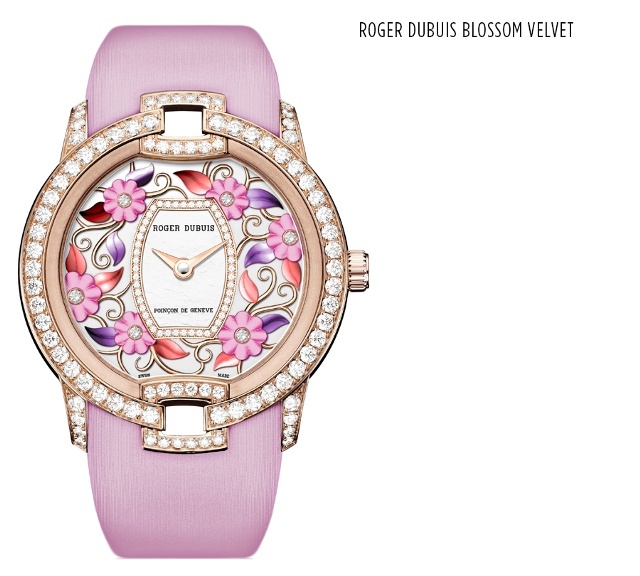 The second SIHH release for women is the 36mm Blossom Velvet in blue or pink featuring grand-feu-enamel-sculpted flowers flowing over a mother-of-pearl dial. The flowers boast gold stems and diamond centers; all float around a diamond-framed tonneau central dial where the hour and minute hands do their thing. As with the Secret Heart, inside is Caliber RD821 fully compliant with the Geneva Seal. 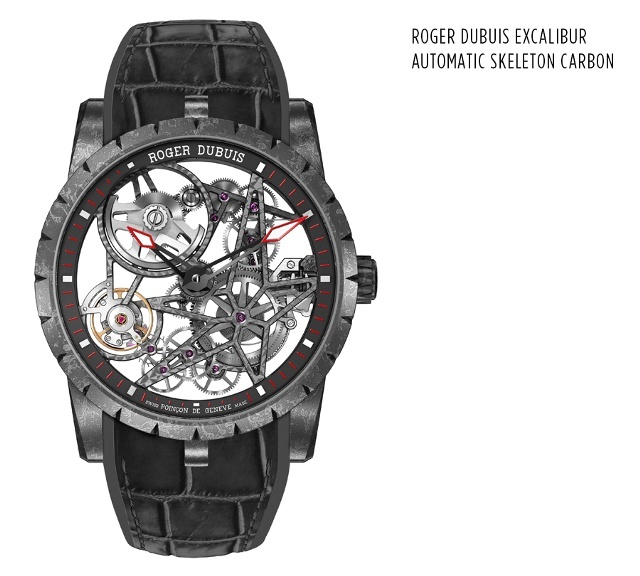 One of the men’s model Roger Dubuis is showing is a second-generation non-tourbillon Excalibur skeleton timepiece called Excalibur Automatic Skeleton Carbon. The new watch is powered by the same skeletonized automatic movement that debuted in 2015. But this year the watch itself is clad in a high-tech composite known as carbon fiber sheet molding compound (SMC). This material is produced by compressing carbon fibers with resin and steel that have been molded at extremely high temperatures. The resulting material is then reworked and compounded with resin. The newly sporty, somewhat technical piece last year debuted in a dressier rose gold case. This year’s models are both harder and lighter than those models even though the watch’s primary components, notably its 42mm round shape, skeletonized movement (with internal star shape), fluted bezel, triple lugs and Dauphine-type gold hands, remain. However, this newly sporty interpretation blackens the gold hands and adds red-tips and a hot red minute track around the dial. The watch’s RD820SQ automatic skeleton caliber is equipped with an openworked version of the micro-rotor Roger Dubuis introduced in 2005. Despite being newly skeletonized (since 2015), the rotor still delivers the same winding power as its non-skeletonized brother, and both maintain the equivalent winding power of a central rotor. Those familiar with the brand may know that the vintage restoration project kicked off in 2015 with a stunning 60mm pocket watch dedicated to the opening of the Roger Dubuis boutique in Geneva. Each year company founder and watchmaker Roger Dubuis will choose a particular vintage movement blank for the company to restore. The common theme of these restoration pieces is that each will bear the Poinçon de Genève (Geneva Seal) and will feature a perpetual calendar, either on its own or alongside a minute repeater, tourbillon or chronograph. 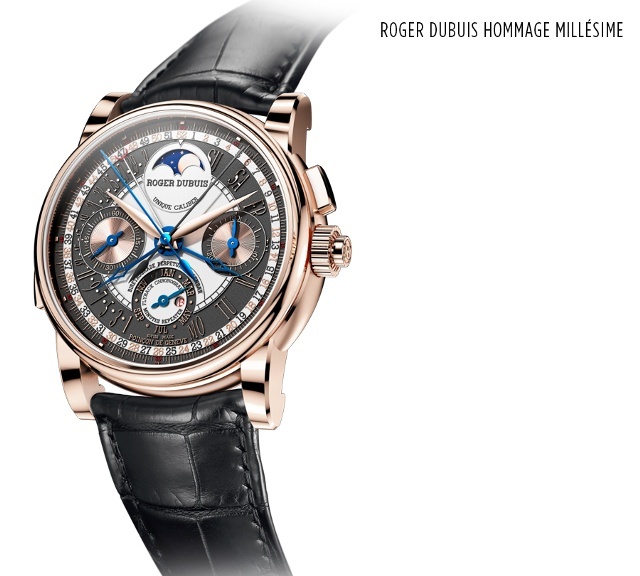 All the restorations are based on movement blanks from Mr. Roger Dubuis’ own collection. They are each restored and upgraded using only authentic artistic crafts and techniques. If any parts are missing or damaged, the replacements are only made by hand and according to the original construction (which sometimes requires creating a few missing parts). Furthermore, Roger Dubuis upgrades the pieces to comply with the requirements of the Poinçon de Genève—a standard met by all Roger Dubuis timepieces. The unique piece pictured here is destined to reach the New York boutique in February. It’s a bi-retrograde perpetual calendar flyback chronograph that also features a minute repeater. Full technical details are still forthcoming, but from its spectacular dial one can see the retrograde hands, blued chronograph hands and multiple subdials that mark many of Roger Dubuis’ early designs. The monopusher chronograph alone is a difficult complication for any watchmaker to realize, but to combine it with this watch’s calendar and chiming functions is truly impressive.